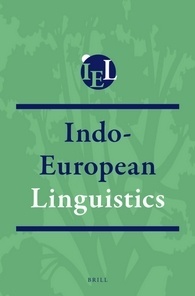 The peer-reviewed journal Indo-European Linguistics (IEL) is devoted to the study of the ancient and medieval Indo-European languages from the perspective of modern theoretical linguistics. It provides a venue for synchronic and diachronic linguistic studies of the Indo-European languages and the Indo-European family as a whole within any theoretically informed or analytical framework. It also welcomes typological investigations, especially those which make use of cross-linguistic data, including that from non-Indo-European languages, as well as research which draws upon the findings of language acquisition, cognitive science, variationist sociolinguistics, and language contact. Indo-European Linguistics is a fully Open Access journal, sponsored by the UCLA Program in Indo-European Studies. All articles are freely available online, ensuring maximum, worldwide dissemination of content. As the journal receives a subvention for publication the Article Publication Charges are waived. The journal is also available in print, one volume per year.